Over the last 18 years, we’ve grown from a three-man operation focussed solely on design and build to a 90-strong, lean digital agency with a strong culture and a product mindset. During that time, the model we operate on has shifted beyond all recognition – thanks in no small part to the wealth of business-savvy writers who’ve provided us with expert guidance and food for thought along the way. Here, our CEO Tony Foggett outlines six key books that have helped to shape the evolution of Code Computerlove. David Maister studies the service business model for a living. It’s been a long time since I read this but ‘Strategy & The Fat Smoker: Doing What's Obvious But Not Easy’ heavily influenced my views on the role of leadership, business design and creating the right culture. 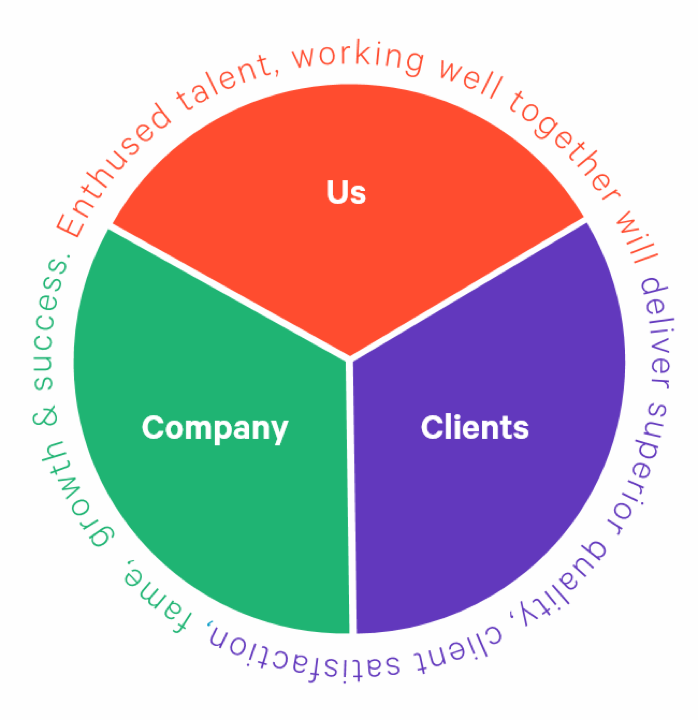 I established the ‘Happy Wheel’ we use here at Code (see below) after reading it and learning about the value profit chain; it’s a basic model that sits under all strongly-performing service businesses and creates a virtuous circle of evolution. This is a must-read for anyone leading change within a business. In 2010, we began a major transformation of Code’s culture, methods and environment; this book gave me the confidence to implement what I believed we needed to do in a meaningful and embedded way. Maister also co-wrote another great book we’ve used a lot, called ‘The Trusted Advisor’. A brilliant (and short) insight into team dynamics and how to promote performance through collaboration rather than control. It made me realise that the silos and management style that had been introduced as we grew were undermining the ability for our talent to fulfil their potential. ‘Creating Effective Teams: A Guide for Members and Leaders’ has had a huge influence on how we have structured and designed the business. In our industry, learning is often focused on developing our practitioning skills – the what we do – when in fact our ability to collaborate and work well with others, i.e. the how we do it, has just as much influence on our performance. We give a copy of this to all new starters here. Dan Pink’s Drive offers a great insight into what motivates folks in a problem-solving, ‘right brain’ world. The book really brings to life the modern relationship between business and their employees and emphasises the responsibility our leadership team have to create the right ‘conditions’ for our staff to excel. If the first three books were influential in the design of the business, The Advantage acted as a great practical guide for our senior management team. We read this book together and used it to create several workshops that established the alignment, clarity and behaviours we needed to be successful leaders. This is a process we plan to repeat every couple of years now. As part of the change we made in 2010, we adopted a new ‘religion’: Agile. This helped us to optimise how we worked together within Code and felt like a much more relevant approach. Over the last couple of years, ‘The Lean Startup’ has helped us push this change further, influencing the vision that we’re working towards for the agency and fundamentally shifting our understanding of the kind of relationships we need to build with our clients. This is another one we hand out to all new starters. “If ‘The Lean Startup’ was the inspiration then ’Running Lean’ is its implementation companion. For me, compared to other ‘agile / lean’ books which focus on the theory, ‘Running Lean’ is more real-world and offers solid practical advice. Ash uses the book to walk you through a real life set of cycles/outputs where he can showcase the processes at each step, which makes it easier for people to see how they can actually apply it in their business. A couple of other books worth a mention are ‘Perfect Pitch: The Art of Selling Ideas and Winning New Business’ by Jon Steel – a brilliant and enjoyable book (pitching is such a flawed process for finding an agency partner but if we have to play the game, we might as well play it well) – and ’Rocket Fuel: The One Essential Combination That Will Get You More of What You Want from Your Business’ by Gino Wickman and Mark C. Winters, which was really handy in helping Louis and I to define our roles and play to our strengths; a must-read for entrepreneurial business founders or a solo leader looking to find that perfect wing woman/man.